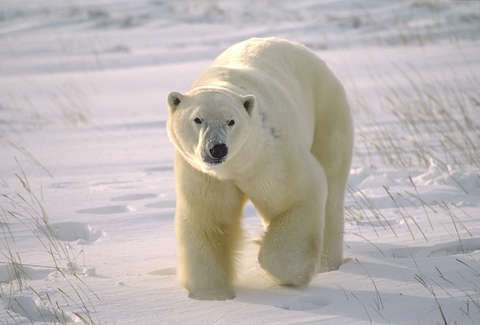 One of the best parts about polar bears is that you're nowhere near one right now. Look, those Coke commercials lied; they're large and scary and, again, just so very large. Just ask the residents of this Russian settlement. A state of emergency has been called in the remote Russian region of the Novaya Zemlya Islands after "dozens" of polar bears have descended upon the settlements there. The BBC reports that Belushya Guba is home to just a few thousand people, and bears have been attacking those residents and finding their way into buildings, as you can see in the video below. In the local military garrison alone, over five have been spotted, and Gizmodo cites a figure saying that at least 52 have been seen since December. "I've been on Novaya Zemlya since 1983," administration head Vigansha Musin said in a press release. "There's never been such a mass invasion of polar bears." This invasion is attributed to climate change, which is forcing the bears to look for food in new places. In Russia, the bears are considered endangered, so hunting them is banned, but if the problem continues, they might have to "cull" the animals, which means what you think it means. The bears have reportedly "lost their fear of police patrols and signals used to warn them off." "People are scared, afraid to leave their homes," said the deputy head of the local administration, Alexander Minayev. "Their daily routines are being broken, and parents are unwilling to let their children go to school or kindergarten." He added that there are constantly six to 10 around the settlement.